U.S. Postal Service customer-service manager Wanda Prater (left) and station manager Bonita Brown pick up comments from East Village Association members Jan. 4 at the Happy Village. To reach the Wicker Park station, call 312-243-4760; the district office is at 312-983-8400. 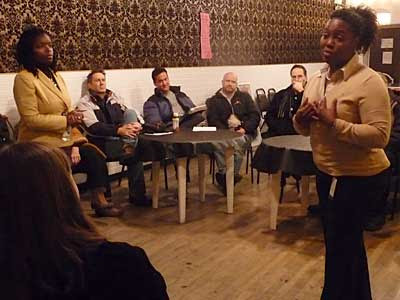 Guest speaker Bonita Brown, station manager of the Wicker Park post office, was present to listen and address concerns of East Village residents. Mrs. Brown stated that the Wicker Park post office has changed locations to two addresses: 1419 W. Carroll for package pick-ups and 1300 N. Ashland for post office boxes and customer service. Concerns were raised by residents of East Village that mail was not being delivered, being delivered to incorrect addresses or being delivered late, and issues were raised about substitute delivery personnel. Mrs. Brown documented concerns and stated that all mail should be delivered between the hours of 10 a.m. and 5 p.m. She also mentioned that substitute delivery personnel may take over one route but may also have to assist with other route that same day and that they are not given uniforms other than a USPS hat. Mrs. Brown also stated that a route adjustment was just assigned about 4 months ago and it is taking some time for the delivery personnel to become familiar with their new route. Mrs. Brown stated that all concerns should be raised by contacting the 866 number located in the retail station at 1300 N. Ashland, and lost packages or never received packages can be addressed by filling out a form 1000 at that same location. Committee Reports: Rich Anselmo and Scott Rappe both met with Ald. Manny Flores regarding pending Planning, Preservation and Development concerns. First, Alderman Flores stated that he was in favor of multiuse, transit-oriented development for the former Pizza Hut lot. He also stated that he was in favor of extending the Pedestrian Designation to Ashland Avenue and instructed his chief of staff to move forward on this issue. In regards to Miller Lumber and the parking spaces in front of the property, members discussed whether those spaces would be included in the sale of the property. According to Scott Rappe, the parking spaces are city property and the Pedestrian Designation should be restored there. Marjorie Isaacson stated that backing out into Division Street is illegal. However, Greg Nagel presented the argument that if the property is being negotiated EVA should not make a statement regarding the parking spaces without a discussion during a membership meeting with the current owner present.